Is a bar soap better for your dog? Check the liquid pet shampoo you’re using. It’s probably made with detergents and synthetic fragrances that can cause dry skin and trigger allergies. 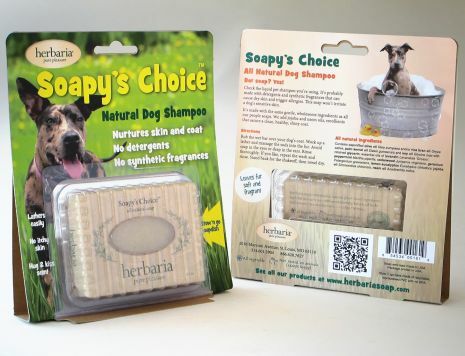 This soap won’t irritate a dog’s sensitive skin. Soapy's Choice™ is made with the same gentle, wholesome ingredients as all our people soaps. We add jojoba and neem oils, emollients that ensure a clean, healthy, shiny coat. The Soapy's Choice kit contains our Soapy's Choice bar along with a Stow 'n Go Soap Case. The lightweight clamshell is remarkably durable. It is vented so that bars dry between uses. Shake out any water from the case before putting a wet bar away. “We appreciate the case. It's so easy to store the soap till we use it again. And we use this bar over and over. It lasts!"